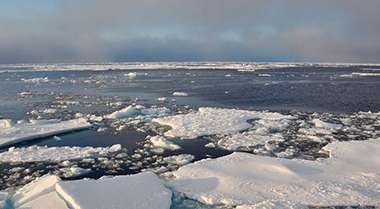 Accelerated climate warming could bring an ice-free September to the Arctic by 2054, a University at Albany study predicts. (Phys.org) —Accelerated climate warming propelled by greenhouse gas emissions could bring an ice-free September to the Arctic by 2054, a University at Albany scientist predicts. In the study "Reducing spread in climate model projections of a September ice-free Arctic," published in the Proceedings of the National Academy of Sciences, UAlbany Professor Jiping Liu of the Department of Atmospheric and Environmental Sciences (DAES) used climate model simulations from the Coupled Model Intercomparison Project Phase 5 to predict that the Arctic will reach an effective ice-free state—defined as less than 1 million square kilometers—between 2054 and 2058. "An ice-free Arctic would have a significant impact on the ocean's ecosystems, biogeochemical feedback, and extreme weather and climate in the mid- and high-latitudes," he added. "It will also affect Arctic maritime and commercial activities, including shipping, transport, and energy exploration." Minimum sea ice cover occurs during the month of September, which is summer in the Arctic. Within the past few decades, the Arctic polar icecap has declined in range and thinned dramatically. Satellite data shows September Arctic sea ice has decreased some 40 percent since the late 1970s. Constraining model biases and estimation based on strong relationship between simulated present and future sea ice extent with observed starting sea ice extent for 2007-2011. "The two different methods suggest that sea ice could decline to some 1.7 million square kilometers by 2060 in a moderate greenhouse gas emissions scenario, while a high-emission scenario could push the annual minimum below 1 million square kilometers in the 2050s," Liu said.